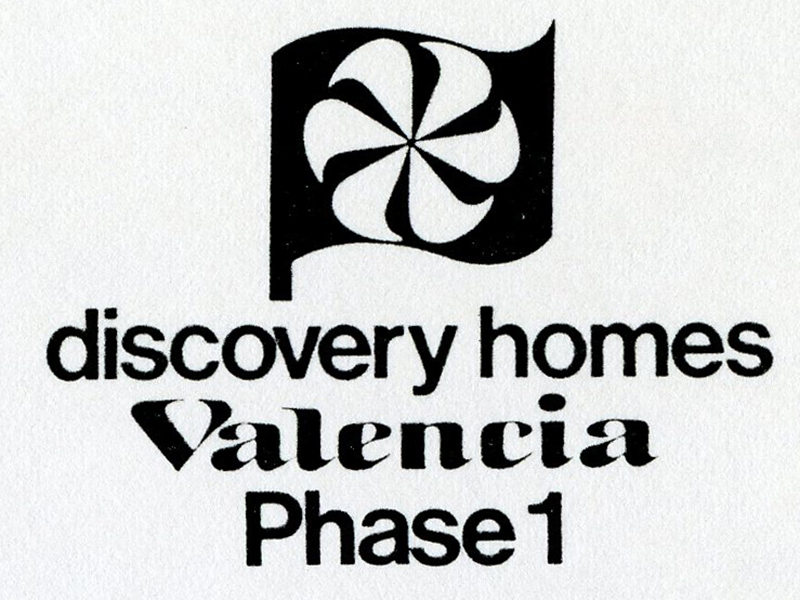 SCVHistory.com HB1819 | Valencia | Discovery Homes: New Home Brochure & Floor Plans, 1979. 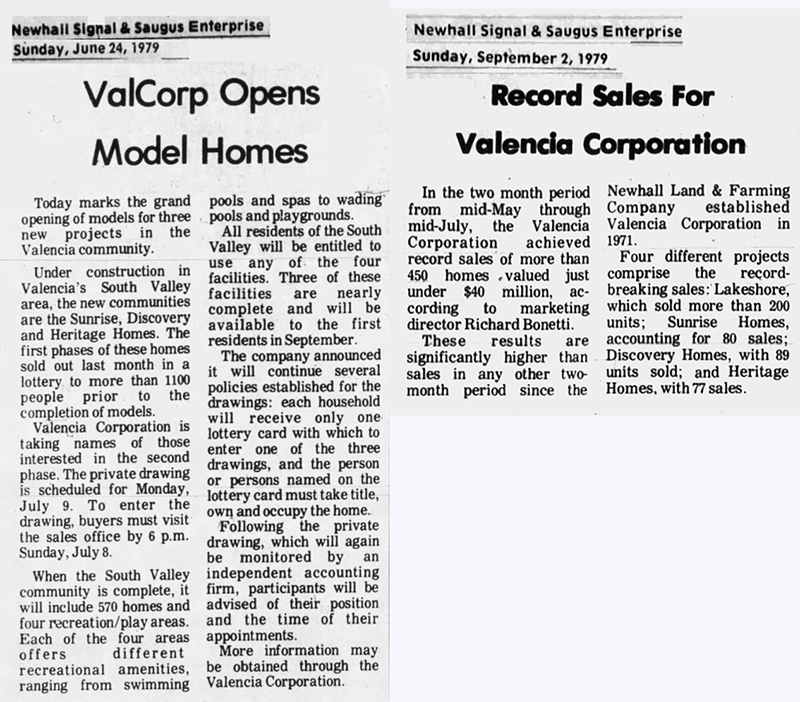 Valencia Corporation (a Division of The Newhall Land and Farming Co.), 1979. Discovery Homes ... quality patio homes that give you more yard for your money. Discovery Homes are single-family detached homes that give you a generous rear yard plus extra yard space on one side for a sideyard patio. Front entry walls give added privacy and use of your yard. Interiors are spacious and contemporary, opening up to bring the outside in. You automatically become a voting member of the Valencia South Valley Homeowners Association, which maintains common areas such as paseos and recreation centers, enhancing your lifestyle and investment. 4 private recreation areas ... use any or all. Living in Valencia is a total experience. And fun is a big part of it ... which is why we've provided a recreational smorgasbord of four private play areas, each with its own personality. Treats for all ages are short, pretty walks from everyone's doorstep. You can enjoy an old-fashioned picnic right in your neighborhood; unwind after work with 20 laps and a dip in the jacuzzi; or watch your little ones swing, splash, climb and tumble with delightful abandon. And, in keeping with Valencia's commitment to farsighted planning, all pools are heated with the help of solar energy. Man and nature are working together to make Valencia one of the finest new towns in America. Nature provided the 5,000 acres of land, year-round sunshine, rugged mountains and visibly cleaner air. Man has provided a far-sighted master plan to insure quality and protect and enhance your investment. In addition to fine homes, Valencia offers recreation, schools, shopping, churches and employment ... all designed to work well together both today and tomorrow. Recreation comes in many shapes and sizes: private recreation centers in every neighborhood; public parks a short walk or bike ride away; lighted, landscaped paseos connecting homes, schools and recreation centers; three golf courses; new Oakwood Racquet Club with 11 tennis and racquetball courts; nearby Magic Mountain, Castaic Lake, and the Angeles National Forest. Valencia has fine schools for preschoolers through collegiates. Two neighborhood shopping centers are within 5 minutes from home and more shopping is planned. There are also three churches, two colleges, a civic center and a clean landscaped light industrial park. The more you know about Valencia, the more you'll want to call it home.